There should be a match between the patient’s personality and that of the caregiver’s. 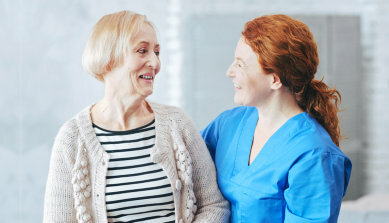 For us at the Dover Healthcare Services LLC, the full-fledged Healthcare Services in McKinney, Texas, patient-caregiver relationship is at the core of our business. A caring and compassionate personal relationship between the two is a vital element of quality patient care. What’s the use of the skills, the trainings, the qualifications and the experiences the caregiver has when he/she cannot see eye to eye with his/her patient? Forget the efficient systems of the health care providers, the technology that they use, their mission, vision, goal and what have you, if on the patient-caregiver level something is amiss already. It is for this reason that Dover Healthcare Services LLC deploys a health care coordinator to your homes to check on the condition of the patient including his/her needs and personality before we choose a caregiver for him/her. That way, mismatches are avoided. It has always been our goal to create a caring environment that will foster meaningful relationships between the patient, caregiver and the family members. In the process of delivering services to you and your family at home, our hope is that you’ll feel confident in our ability to meet all of your expectations and know that our patients are always our number one focus. In fact, we, at the Healthcare Services in McKinney, Texas, go to great lengths to hire staff members who are bilingual in Spanish and English for that purpose. In all of the services of Dover Healthcare Services LLC, patient-caregiver relationship occupies the top spot in our list of priorities. And we are confident in delivering excellent service if we set it right. If you or a loved one is in need of any of the services listed above, you know where to turn to for expert assistance. You can always keep in touch with the Healthcare Services in McKinney, Texas, through the following means of communication: phone 214-351-3360, fax 214-988-1488, or email info@doverhealthcare.com. Please visit also our website doverhealthcare.com for more details about our company and our services. Please take time to drop by our place at 2516 Shady Grove Lane, McKinney, Texas 75071 (view map & directions »). Do you have any experiences about having a caregiver in your own home? What was it like? Please leave your thoughts on it on the comments section below.